sometimes you are playing scrabble with your family (a family who, unbelievably, only just discovered the game) when you remember that thing you said about showing up here everyday this month. you think maybe you can do two things at once. you are losing at scrabble anyway. 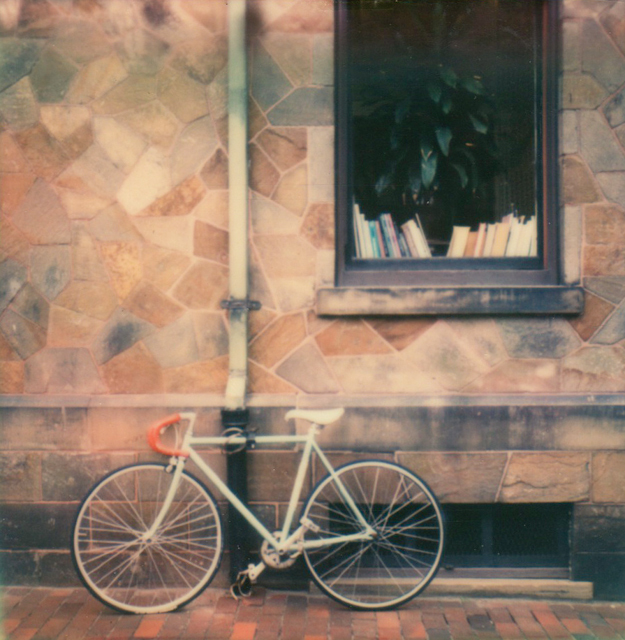 you remember the polaroid you took a little over a month ago in providence, how it made you so happy, that bike with the red handlebars, those books in the window, that patchwork cobblestone. you wish you had some big story to go along with it, but you don't. you were just walking and there they were-- the bike, the books, the window, the cobblestone. the light was right, the timing was right, so you took the picture. bike and books, books and bike. it seems like such an ordinary scene. but then it occurs to you just how much freedom these two things have afforded you throughout your life, how many places they've taken you over the years. and then it is your turn at scrabble (again) and you have no good letters. you are unable to form any obscure, triple-scoring words. but you do have this polaroid, you have the promise of bikes and books. and you showed up here, just like you said you would. and so, here's to tuesday night. I'm so happy for nablopomo. I love these posts from you. I love your words and your photos. For many years now. Thank You! ahh, well thought, well said, and (of course!) well photographed as always. I'm trying, too. Not doing so well - but trying. Trying is always good, right?